The scientific pursuit does not occur in a social vacuum, disconnected from our cultural experiences. At Small Things Considered, we usually stick to the data and stay away from potentially explosive topics like politics. Sometimes we detour into historical context or consider biographical tidbits on the personalities involved in our field. But usually no further afield. We likewise rarely speculate on the type of damages that the human practice of microbiology may have caused or may yet cause. With tyrannical specters increasingly poised to attack science, a defensive posture highlighting the positive outcomes of science seems justified. Yet we should also recognize the negative aspects that have come from human attempts to harness and/or control microbes. Two recent books examine both our successes and failures to reduce or prevent damage from microbes, or to exploit their hazards. The books differ in tone and in their intended audience: The Vaccine Race takes a broad historical perspective while Germ Wars has a more specialized, academic approach. But both highlight the incredible successes and the profound mistakes that humanity has had while dealing with some of the scariest human pathogens. They remind us that despite all the good intentions of science and the ideals of pure rationality, the reality of microbiology is very imperfect — very human. Written by Meredith Wadman, a journalist specializing in biomedical research politics for the past two decades, The Vaccine Race chronicles the history of modern vaccine development. It specifically focuses on the vaccine against rubella virus produced through the work of Dr. Stanley Plotkin at the Wistar Institute in Philadelphia. The topic of vaccines comprises a third of Wadman’s focus. Plotkin’s vaccine development was due to advances at the Wistar Institute in cell biology. This second major topic concerns Leonard Hayflick’s characterization of human cell line behavior and his role in isolating WI-38, a non-cancerous human fibroblast culture line that could be used for viral vaccine production. The science behind both the vaccine and cell-culture-line stories intersect with politics to form the third component of The Vaccine Race: the professional and ethical conflicts that influenced scientific progress. Although familiar with the molecular biology of viruses and theoretical basis of vaccination, I knew little about the practical development of vaccines prior to reading this book. And I never had heard the history of Hayflick or appreciated the advances in cell culturing that led to modern vaccine discovery. The book therefore fills an important educational niche for the field. The Vaccine Race starts with a prologue on the damage that rubella virus historically has caused and introduces Hayflick as an ambitious young scientist working in the lab of Hilary Koprowski, one of the first creators of a polio vaccine. It then dives into the history of The Wistar, detailing the science behind human cell line developments, its ties to the polio vaccine, and the widening search for vaccines against additional scourges. Wadman entitles this first part of the book “The Cells”, and follows its chapters with a long second part, “Rubella”, and a brief concluding section titled “The WI-38 Wars”. The titles to these parts imply a division of content that is not there, making the organization of The Vaccine Race problematic. Expertly researched and detailed through a combination of interviews, articles, and first-hand documents, the book illustrates Wadman’s ability to uncover a story in its complexity. But that complexity is not carefully laid out for readers. The topics of WI-38 cells, rubella, vaccine creation, and conflicts over them are not easily separable. Each part of the book deals with all of these topics, while also hopping back and forth in time and location. At times, this makes the book repetitive and potentially confusing. Despite these organizational flaws the writing style is easily approachable. Beyond the science, Wadman acknowledges and reminds readers of the practices of the day that we now would consider unethical, from the large-scale use of primates in research to the use of marginalized populations like orphans, prisoners, or the mentally ill in vaccine testing. Wadman relates how these practices became unacceptable, and explains the measures taken to assure informed consent. She also draws light upon ethical considerations that still remain controversial, most notably the use of cell lines like WI-38 obtained from aborted fetuses. Groups such as the Roman Catholic Church continue to grapple with such bioethical matters. Her narrative also reveals the conflicts and egos that influence the science, and their role as impetus for political actions and legal standards. These include controversies over the purported superiority of the WI-38 cell line for reproducible growth free of mutation and contamination, and regulatory politics that favored non-scientific criteria in making decisions. The relevance of this history to today should be obvious as we witness erosion of regulations and ignorance or hostility to data when making political decisions that impact the health of potentially billions. Another source of conflict arose from competing strong personalities. Hayflick’s ultimate dissatisfaction over not gaining professional recognition for his discoveries (including identification of Mycoplasma as a contaminant of cell lines) led him to depart the Wistar for Stanford and taking WI-38 with him. Hayflick began charging money to be able to keep up with requests from around the world for the cell line as it gained acceptance. 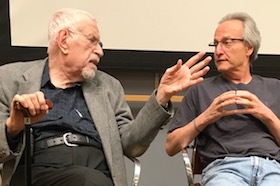 Wadman concludes her book by focusing on the details of how this led to NIH investigation of Hayflick for profiting from a public resource, events that proved hurtful to Hayflick’s reputation. In the eyes of many at the time his actions were reasonable, and his became one of the first cases to test issues of intellectual ownership. Although today there’d be little question that he was in his rights, issues surrounding intellectual property still bear relevance for academicians and the biotech industry today. Wadman does a credible job of maintaining a journalistic impartiality when it comes to contentious political and cultural issues, both those historical and those that continue to rage today. For those interested in more information, an interview with her about The Vaccine Race is available through C-SPAN. She succinctly summarizes her intent in writing Germ Wars: “I explore the contentious politics of bioterrorism to show that the work of science and government forges links between microbes and people in ways that create new identities, institutions, and inequalities.” This puts Germ Wars into the realms of Michel Foucault’s biopolitics, applied to the prokaryotes within and around us, not just our human selves. A chapter entitled ‘Microbes for War and Peace’ details how the marriage of war and science shaped directions at Fort Detrick in ‘making the modern microbe’. I found this section particularly interesting in the history of how the government designed spaces for work with dangerous agents and developed the BSL designation. Beyond the historical, Armstrong is most concerned with how humans blurred offense and defense in these matters. A later chapter picks up on this theme with exploration regarding the role of the CDC in bioterrorism, particularly its expansion from control and prevention to emergency response, a social construct of militarized public health. A weakness of Germ Wars lies in tying up its conclusions in practical terms beyond an academic thesis. The book does not offer much up in speculation of what might be done differently, what might be preferable. Though extensively footnoted with a hefty bibliography and appendix, some of Armstrong’s statements could use a more detailed explanation. One example is the assertion that influenza vaccination serves as a process of authority over third world countries. Interesting perspective and idea here, but needing more elaboration. Whether with a spotlight on individuals or a general society, The Vaccine Race and Germ Wars paint pictures of segments of microbiology that highlight their human imperfections and successes alike. Each of these books may attract different readers, but they both would provide Small Things Considered readers with ideas that one may not routinely consider, even to those familiar with the science behind the topics.